The following episode guide for Season One was contributed by Ken Lynch who hails from Australia. Photos are by Patrick Sansano. Patrick is from France and has an excellent and entertaining Episode Guide of his own which I encourage you to visit. If you don’t speak French, use Google Translate to read his commentary. Note: photo slide show of Season One at the bottom on this post. The first season of 18 episodes (including two double-episode specials) did a great job in establishing the premise of the series. Besides the action-adventure aspects of the series, a central feature of this and the next two seasons was the undercurrent of a potential love affair between Jack and Paula which was always there (particularly in some early episodes) but never actually went anywhere. The outdoor scenes created a believable African atmosphere despite some annoyingly frequent re-use of selected scenes (such as the black leopards leaping around their cage, the baby giraffe looking up) and some obvious mis-matching of real-life African footage with sequences filmed at Africa USA (eg. the medical attention given to a zebra in Episode 1.5 is a prime example). Despite this, the quality of the first season episodes improved over time – perhaps due to the use of a core of writers – including Stephen Kandel (5), William Clark (4), Robert Lewin (2), Richard Carlson (3) – and three directors – Otto Lang (4), Paul Landres (7), Andrew Marton (7) who progressively knew the characters and played up the elements that worked. Don Marshall appeared in three episodes as Luke. It is unclear from the screening order of this season as to whether he actually appeared in the first three episodes filmed and was then replaced by Hari Rhodes, or whether he appeared intermittently in Episodes 1.2, 1.3 and 1.5 as screened. It is most likely that it was the first scenario with Episode 1.1 being specifically written and filmed later in the schedule (with Hari Rhodes) to create an episode that very effectively explains the setting and introduces the characters. A baby elephant strays into the reserve and so Marsh, Paula and Jack try to find its parents. In the search, they encounter two men claiming to be photographers, but who have really killed the elephant’s mother. The men steal the baby elephant, Clarence and Judy, but discover they’ve got more than they bargained for when Judy steals the keys from their truck and lets the air out of their tyres. When Marsh catches the thieves, he is shot with his own tranquilliser rifle, leaving the two men a clear path to escape with the prize animals. Notes: Written by Robert Lewin and directed by Otto Lang. This appears to have been a specially written episode to introduce the series, and to explain the purpose of the Study Centre and the tranquiliser guns, etc. It was filmed some time into the shooting schedule. Watch for Hari Rhodes’ obvious fright when the cheetah is first brought in. The Dispensary set used would change overtime. Marsh, Paula and Jack are on the trail of a Wakanda animal poacher when he is injured by one of his own snares. As the native goes into a coma, he sees a lion chase away hyenas and vultures before he awakes at the study center. As he is nursed back to health, he is convinced that it is not right to hunt on the game reserve. The native disappears with Judy and, while Marsh searches for him, bandits take the animals from the centre. With the native still missing, Marsh, Luke and Jack are captured by the poachers and locked in an animal cage. Notes: Written by Stephen Kendal and directed by Paul Landres. 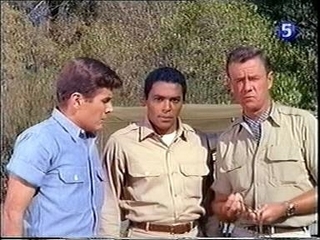 Guest stars Don Marshall and Percy Rodriguez as the native. Rodriguez would return in another role in Episode 3.7. There are some badly mis-matched shots during the zebra-capture scenes. The bush setting location used for this scene had been featured in the Clarence movie and was re-used several times in subsequent episodes. Marsh refers to Jack and Luke as ‘interns’, rather than ‘associates’ as he does later in the series. The hunting Wakanda tribe is referred to again in Episode 1.12. One of Marsh’s neighbours has a pet lioness named Lady Pembrook who has recently become irritable. While bringing the lion to the study center for treatment, a farmer threatens to shoot the lion. The lion mauls the farmer during the argument, and he becomes determined to kill the animal. Marsh removes a tumour from the lioness which is the cause of the animal’s bad behaviour. When the lion recovers, the farmer arranges to let it out of its cage and to track her down. Notes: Written by William Clark and directed by Otto Lang. Guest stars Don Marshall as Luke and Alan Napier (from Batman). A subsequent reference is made to Lady Pembrook in Episode 2.1. The road taken to deliver Lady Penbrook was re-used in several episodes, including Episode 1.5. This episode includes the first ever look at the outside and inside of Hedley’s sub-district office. Marsh, Paula and Jack are taking samples from a water hole when Judy disappears into the bush. They return to the Wameru compound knowing that Judy and Clarence will return home. Judy takes Clarence to where a mother lioness is trapped in a net set by poachers Giles and Stokes. Nearby are three cubs which Judy takes home, protecting them from hungry animals. At the house, Judy and Clarence care for the cubs which will not accept food. Marsh guesses that the cubs’ mother has been injured or is sick. Meanwhile, the poachers have the lioness in a cage when Hedley enters the scene. This starts a conflict which becomes tense and dangerous before all is well. Notes: Written by William Clark and directed by Paul Landres. This episode is heavily reliant on specially filmed scenes with Judy and the lion cubs interspersed with the actors saying dialogue that sets up the scenes. Mike has some of his first extended scenes. Some explanatory shots of the bear with the lion cubs were re-used later in the series. Marsh and Paula are on their way to pick up Janet Lorne, from a foundation supporting the animal study center, when they find a wounded zebra on the game reserve. After treating the animal, they hear from Hedley that Roy Meadows, a suspected murderer, is thought to be in the area. While Marsh shows his guest around the reserve, she falls into a pit and breaks her leg. With the help of Judy and the murderer, Marsh gets her from the pit, but Meadows steals the truck and forces him to drive toward the border. Paula and Jack, with the help of Clarence, lead Hedley on an exciting rescue mission. Notes: Guest stars Don Marshall as Luke, Dina Merrill as Janet Lorne, and Ron Hayes as Roy Meadows. Ron Hayes would re-appear as Meadows in the two-part episode Return of the Killer (Episodes 1.10 and 1.11) and even came back in a completely different role in Episode 3.20. This looks suspiciously like the first episode filmed (perhaps as a pilot?) with explanations to set the scene for the series. Paula (unusually) wears a dress and the episode features a different recording of the First Season theme music. It also features a couple of scenes (including the last segment) where Paula and Jack exchange glances hinting at a romance that never really went anywhere, and infers the episode is set very early in Jack’s stay at Wameru. The scenes at the river when Meadows is captured looks like the same spot used for the gorilla crossing from the original movie. The episode was directed by Andrew Marton and was co-written by Alan Caillou (along with Stephen Kendal) who had co-written the earlier Clarence the Cross Eyed Lion film. When Dr. Teresa Warren and Dr. Gene Barr, archaeologists, pitch their tents in Mdala Gorge, they are fearful of attack from predatory animals. They hire a local hunter to kill off the potential man-eaters. Marsh, who has been in conflict with the hunter before, hears of this and he takes Paula, Jack and Mike to the camp to avoid this slaughter. Marsh finds the hunter on the job and offers to capture the animals and relocate them so the scientists can work in safety. But the hunter wants none of this as he has a contract to kill the animals. Notes: Directed by Otto Lang. Harry Lauder plays a rather sympathetic version of a hunter. There are a couple of scenes of hammy acting with routine dialogue, and staged shots with the animals. The rocks featured as the leopards’ lair were used in many subsequent episodes. Many of the publicity shots for the series were actually taken during this episode. The scenes with the leopard on a leash were done with an obvious double for Paula! Amoux and Duval are illegally mining diamonds at a jungle site, posing as palaeontologists digging for prehistoric bones. Despite some snooping by Judy, they convince Marsh, Paula and Jack they are genuine scientists. The smugglers have stowed diamonds in a false bottom of a crate packed with bones. They hire Roy Kimba to fly the crate in his small plane to Nairobi. They are sure their cargo will pass customs. When the plane crashes and Roy is knocked unconscious, a chase develops as the team rush to save Roy from man-eating animals while the smugglers rush for their diamonds. Notes: Directed by Paul Landres. Nico Minardos (from The Flying Nun) and Paul Winfield guest star. Prince, an alsatian dog, is introduced in this episode as a pet of the smugglers. Prince would re-appear in the episode after the next (Episode 1.9) and make several more appearances thereafter. Jack and Paula have great interplay when Jack shows some jealousy towards the two thieves. A different set is used for internal shots of the main house indicating a different concept of the lounge/bedroom area. Marsh wears an Aussie-style hat for the first time. Paula is despondent as Judy has gone missing for a week. Marsh suggests she may not have been killed or hurt but is visiting a chimp family. While Judy is with the chimps, a baby chimp falls from a tree and is critically hurt. Judy steals the baby and gets it to the clinic where the team operate on it. When the baby needs care, Judy acts as the nurse. Later, thinking to reassure the jungle family, Judy brings them all to the clinic. They wreck the place to bring the baby home. Although Judy tries to stop them, they carry the baby away. Because the injured baby needs medication to survive, Marsh goes in pursuit to retrieve the baby from the hostile chimp family. Notes: Written by Robert Lewin and directed by Otto Lang. The standard internal house set from the movie returns and Marsh makes one of his rare references to Paula’s mother. Marshall Thompson does one of his famous narrative voice-overs to explain many of the chimps’ scenes. This episode introduces Toto who subsequently appeared as Judy’s constant companion in later seasons. This is the first of many episodes that is built around footage of Judy, although Clarence has his first scenes testing his eyesight. A farmer is full of hate and bitterness and has trained Prince (see Episode 1.7) to become a vicious killer of wildlife. When Prince is injured and rescued by Paula and Jack, he is taken to Wameru for treatment where the dog learns affection and succeeds in installing a will to live in a Bengal tiger. When the farmer recovers Prince and resumes turning the dog into a savage beast, Judy and Clarence come to the rescue and Marsh is faced with the challenge of trying to make the farmer realise that his hatred will lead to his own destruction. Notes: Written by William Clark and directed by Paul Landres. There are a couple of amusing scenes featured. It is the first of several episodes that continue a storyline from a previous episode (see Episodes 1.10 and 1.11). Weak from a bullet wound suffered during a prison break, Roy Meadows (see Episode 1.5) struggles through the bush with a fellow inmate to reach Wameru. His partner wounds a leopard and when Marsh hears of this, he drives off, leaving Paula behind for voice lessons from Mrs Fusby. The convicts discover Marsh’s parked truck and drive it to the center. Meadows insists Paula operate on his wounded arm. Paula gives Clarence the walkie-talkie and sends him to find Marsh. Hedley arrives at the center and is held prisoner too. Clarence finds Marsh who must now instruct Paula on surgical proceedings to remove the bullet. Notes: Written by Richard Carlson and directed by Andrew Marton. Guest stars Ron Hayes again as Roy Meadows (see comments on his multiple appearances in Episode 1.5), Steve Brodie (from several Elvis movies) as his partner, and Jan Clayton as Mrs. Fusby, a female character very similar to Mr Rowbotham in the Clarence movie.. Jan Clayton would make another appearance as a different character (Sister Maria Francis) in Episode 3.17. Lydia the elephant (also featured in the Daktari books) makes her first appearance. Mike comes across as being inexperienced (and perhaps newly arrived at Wameru) and so the episode could have been written (or even filmed) earlier in the schedule. Using Marsh’s instructions, Paula removes the bullet. Prior to the surgery, two policemen arrive and Hedley talks to them. They leave to search for the convicts but find Marsh instead. While they race back to the center, the convicts take Paula in a truck towards the border. Both cars nearly collide, forcing each off the road. Meadows threatens Paula’s life, but Lydia, a pet elephant, which has followed them from the compound, helps rescue her. Notes: Written by Richard Carlson and directed by Andrew Marton. Guest stars Ron Hayes as Roy Meadows and Jan Clayton as Mrs. Fusby. This is the first episode to have its title specified in the introductory scenes plus a narrative summary of Part 1 by Marshall Thompson. In fact, one of the recap scenes explaining what had happened previously did not actually feature in Part 1 but was filmed especially for this purpose. Barbara Ingram, a magazine photographer, arrives at Wameru to photograph wildlife. She engages a hunter to seek out the Wakanda, a hostile tribe of poachers, to encourage them to enter the reserve. When Hedley discovers them poaching, they attack him. He fights them off until he is wounded. Barbara, who has been filming the battle, finally comes to his aid, dragging him into her photographic blind. Marsh manages to save Hedley’s life, but Barbara goes back to her hide. Unbeknown to her, the hunter has stolen Clarence with a plan to release him to hostile lions so they can be filmed as they fight. Paula discovers the situation, but during their fight the lions tumble into the hide, injuring Paula. Judy attempts to contact Marsh on the walkie-talkie. Notes: Directed by Paul Landres. Joe Higgins would return as the same character in Episode 2.13 and as another character in Episode 4.3, while Doris Dowling would return in different roles in Episodes 2.10 and 3.11. Paula’s jealous bickering (from Episode 1.7) is evident again. The ‘fight’ between Clarence and the other lion looks ferocious but was probably filmed as they played together. Hercules the bear (from Episodes 1.10 and 1.11) appears again. A double (probably Ralph Helfer) is used for Marsh when separating the two lions. Marsh returns to the center to discover Hedley has invited a visiting official and his daughter to his home. Marsh is unhappy to learn they plan to hunt a leopard that has been cured at the hospital. After Jack and Mike destroy every attempt to kill the animal, Judy saves his daughter’s life when approached by a snake. They then agree to accept Marsh’s offer of a live trophy rather than a dead one. When they select Judy, Paula is heartbroken. Hedley escorts the hunting party off the reserve. Judy unlocks her cage and returns to the compound. She returns with Bonnie, another chimp, and everyone is happy even after they learn that the daughter knows of the deception. Notes: Written by Marvin Wald and directed by Paul Landres. David Opatoshu guest stars. Paula’s jealousy features yet again! This is the most obvious example of using the house veranda as an internal studio set rather than the real outdoor actual setting. After two hunters witness Marsh receiving a grant from their foundation, they steal Clarence and Judy, holding them for ransom. Hedley is powerless because the animals are public property. Paula and Jack take Prince and start a search. When the dog leads them to the pair, Jack is shot and Paula is captured, leaving Jack for dead. The dog revives Jack and is sent to find Marsh. Paula escapes but is pursued. When one of them is about to shoot Paula, Clarence faces him head on, forcing him to surrender. When Marsh and Hedley arrive, Paula and her two pets have everything under control. Notes: Written by Stephen Kendal and directed by Andrew Marton. Aussie Chips Rafferty guest stars in a very over-the-top performance. This appearance was one of his last US TV roles before he returned to Australia for roles in Skippy, Woobinda and Spyforce. The team appear in suits and a dress in the opening ceremony – a rare occurrence. Paula and Jack’s interplay is a feature of this episode prior to perhaps their best pairing in Episodes 1.16 and 1.17. The hilltop location used in Episodes 1.3 and 1.5 is featured again. Prince has his second episode with major screentime. Clarence, Judy, Paula and Jack discover a hyena in a pit. Judy intentionally pushes a tree limb into the pit, injuring the hyena, as she was bitten by one as a young chimp. The hyena is removed and returned to Wameru where Marsh operates. Paula nurses Willie but rejects Judy who is jealous. She harasses the hyena by destroying its medicine and leading it into the jungle. A visitor, Col. Colby, accidentally leaves Willie’s cage open, allowing it to escape. Judy is blamed and the search begins. Judy finds Willie with another hyena who attacks. Clarence appears and chases it off. Notes: Written by William Clark and directed by Paul Landres. Paula’s tirades against Judy are perhaps the worst ever in this episode! Fire burns the African bush into a flaming wall of fire after two hunters set the dry bush ablaze in an attempt to drive a herd of rhino off the reserve. Paula, Jack and Judy fight the fire while studying the migration habits of a buffalo named Winston. They start a backfire to create an escape corridor for the fleeing animals, but fall into the hands of the hunters who realise they must kill them to keep their identities unknown. Notes: Written by Stephen Kendel and directed by Andrew Marton. Aussie Michael Pate guest stars (with an Irish accent). This is an entertaining and well-written piece that could stand on its own as a movie. Efforts were made to use some new bush locations which are well integrated with bushfire sequences. The use of smoke pots in some seldom seen canyons is very effective. The actors seem very relaxed and are enjoying their roles – and it shows! After setting the bush ablaze, the two hunters have Jack and Paula who escape into a hill of rocks. Jack sees Winston and gets the transmitter attached to his horn to send an SOS to Marsh. Notes: Written by Stephen Kendel and directed by Andrew Marton. Guest stars Aussie Michael Pate. The episode title is featured in the introduction for only the second time. Marshall Thompson does his best voice-over narration again. The lion pit with the cheetah is also used again as are the leopards’ lair cliff rocks. Watch for the second kiss between Jack and Paula (admittedly on her forehead!). Thirst and starvation face Marsh, Jack and Judy when a power-mad revolutionary abandons them behind prison bars in a deserted African cave once used to hold slaves. Outside, the baddies are loading a truck with rifles that will be used to overthrow the government. The plan is to establish a base at Wameru using the animals as food for the revolutionaries. Notes: Written by Richard Carlson (to include some great interplay between Marsh and Jack) and directed by Andrew Marton. Guest stars Theodore Marcuse (from Elvis’ Harum Scarum) as Dr. Akubar. Marsh wears his Aussie-style hat so that his double could be used when greeting Clarence. I have a brief newspaper article from January 1966 in which Cheryl Miller says that she injured her leg during the filming of one of the season one episodes and had to wear a cast. If you look closely you can see the leg cast a couple of times in the early episodes and there are times you can see a slight limp. She also had to be filmed from the waist up during the time she had the cast. I think the article to which you refer can be accessed at the following web address. It makes great reading and could probably warrant a posting of its own on the Daktari website at some stage! Yes, that’s a great article. It sounded like she intrigued the writer because she was so different from the other deb stars. Hope you won't mind if I share a few thoughts about the upcoming episodes as well…. So cute! Aw man, why didn’t they develop that relationship further? The kiddies could have taken it! Could be where it’s a kids show. But I just wish they could have shown more because they were very cute together. They were good friends off the set too I guess. Yes, I absolutely agree. They really are good together, not just visually but the chemistry works as well. 🙂 Maybe there is a hint about them in one of those books? 1. In the episode Leopards of the Mdala Gorge (s1e7) I think is the only scene where Jack gets away with complimenting someone else than Paula. Of course, this time they needed to waist as much of the hunters time as possible, so it must have been agreed on earlier. But look how good they are together when persuading the him to build that shower. 1.Did it ever accured to anyone besides me how much the “nephew” in ‘The Elephant Thives’ resembles Marshall? Is it just a coincidence, or are the two related? 2.Do you think Roy Medows really killed his companion? He states many times, “I may have murdered him, might not” (or something like this, idk the original plot). As for ‘Return of the Killer’ pt 1., it’s not sure that Mike is new to Wameru. Moreover, later on there is evidence that he knows the local situation better than Jack. (e.g. the village of the elders, or when talking about the emir’s rights to the water.) It’s simply that he grew up in the town, and “wild Africa” is new to him. I am going to defer to Ken on this one as his knowledge of the show is much deeper. Ken? Hi Anna and Susan! I can find no evidence that the actor Dan Ferrone in The Elephant Thieves episode was any sort of relation to Marshall Thompson. The character Roy Meadows came across as a tough and mean criminal in his multiple appearances on the show, so it’s likely that he really did commit a murder. Mike’s background prior to being at Wameru was never really made clear, probably because of the use of various writers throughout the series. However as you pointed out, there was a suggestion in Episode 2.5 (Cheetah at Large) that Mike may have been around Wameru before Jack. This should probably be accepted as being the case as this particular episode was co-written by Marvin Wald, a key person in defining the DAKTARI storylines as the show’s Story Executive and later Associate Producer. Thanks Ken! You certainly do have a deep knowledge of this show!